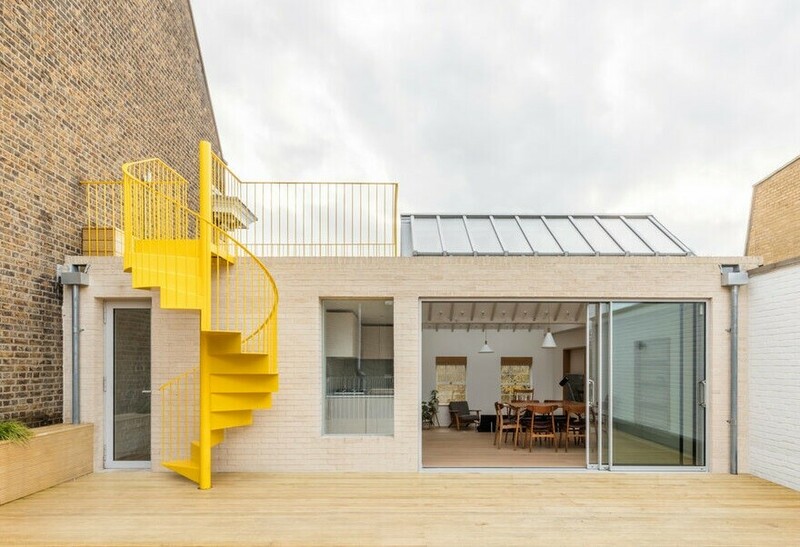 Text by Neil Dusheiko: Dusheiko House is a radical remodelling of a Victorian terrace house in North London. 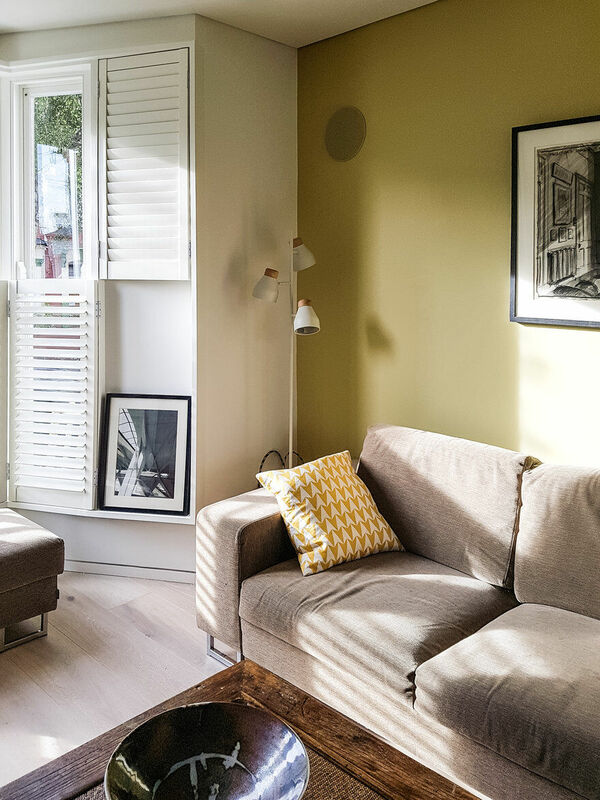 As it is a home for my family, it was a chance to experiment with space and materiality and to explore ideas about what “home making” meant to us. 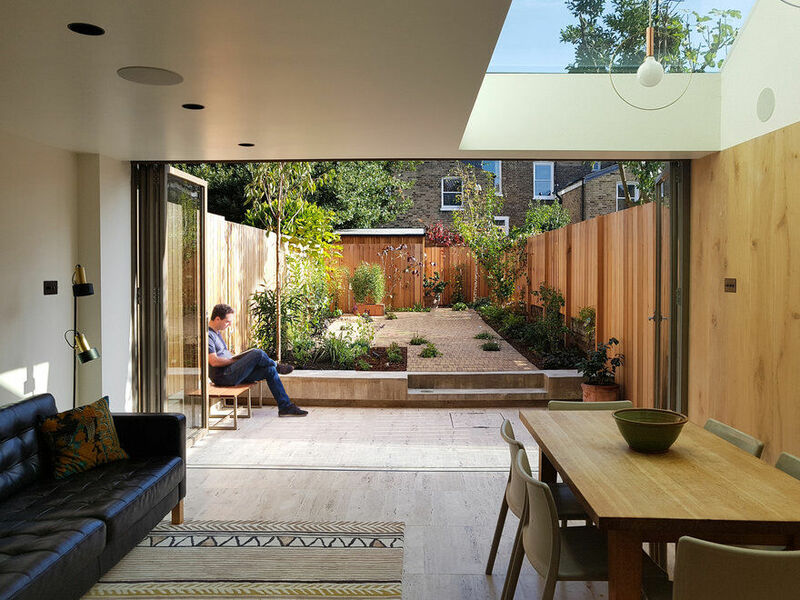 ​The east facing kitchen and dining were one level down from the street, all rooms were split up into a series of dark internal spaces with poor light and no connection to the garden. To access the lower level and the kitchen, you had to go along a corridor and down a dark staircase through an internal room with no light. 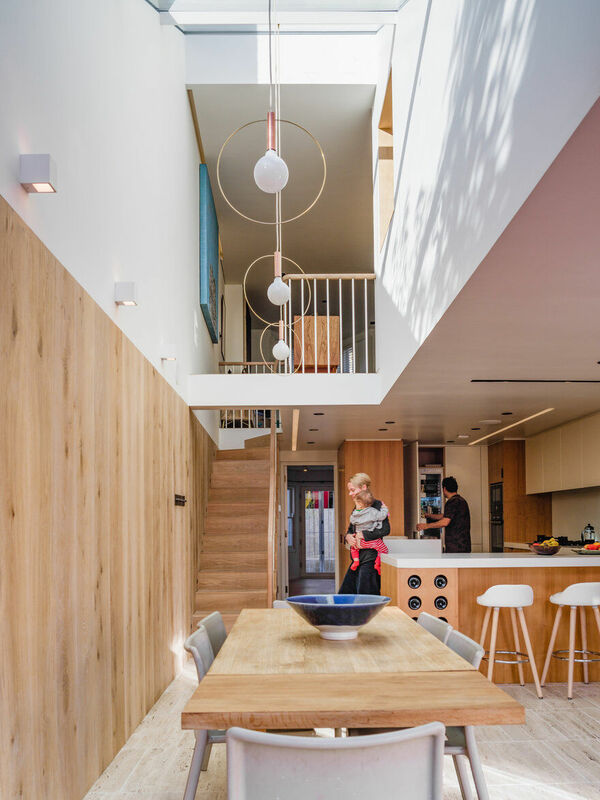 Our designs solved the poor light and circulation issues by moving the staircase to the opposite wall which now connects the living room space directly to the kitchen and dining space. 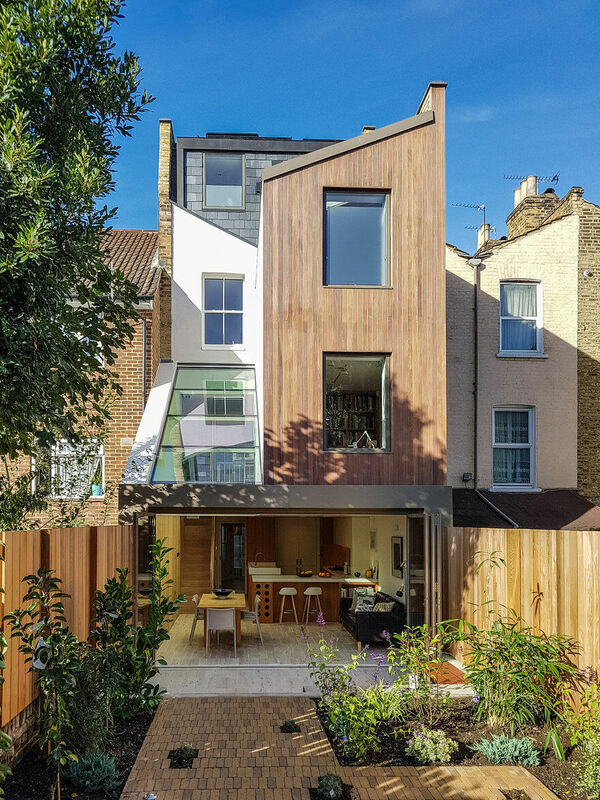 We removed part of the rear facade to allow for a large sloped double storey skylight bringing light into the two levels. 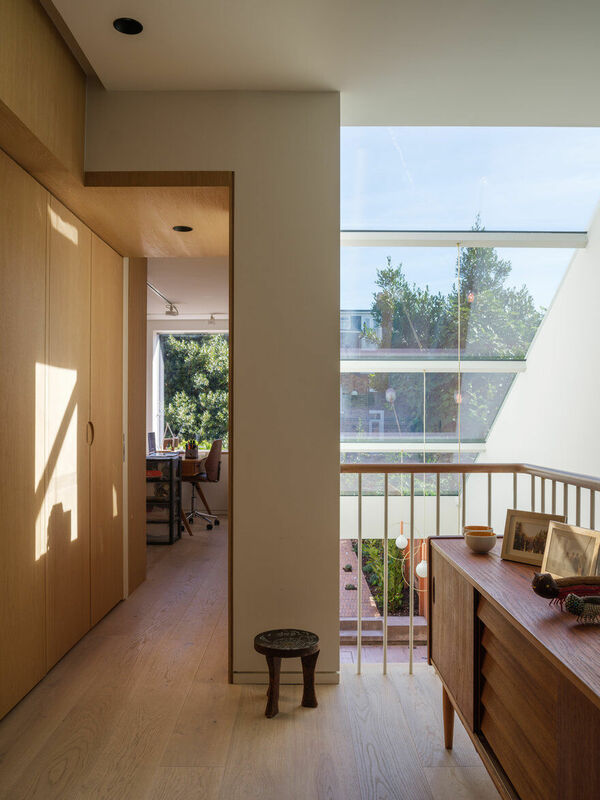 As one walks down the wooden clad staircase there is a direct visual connection to the garden. 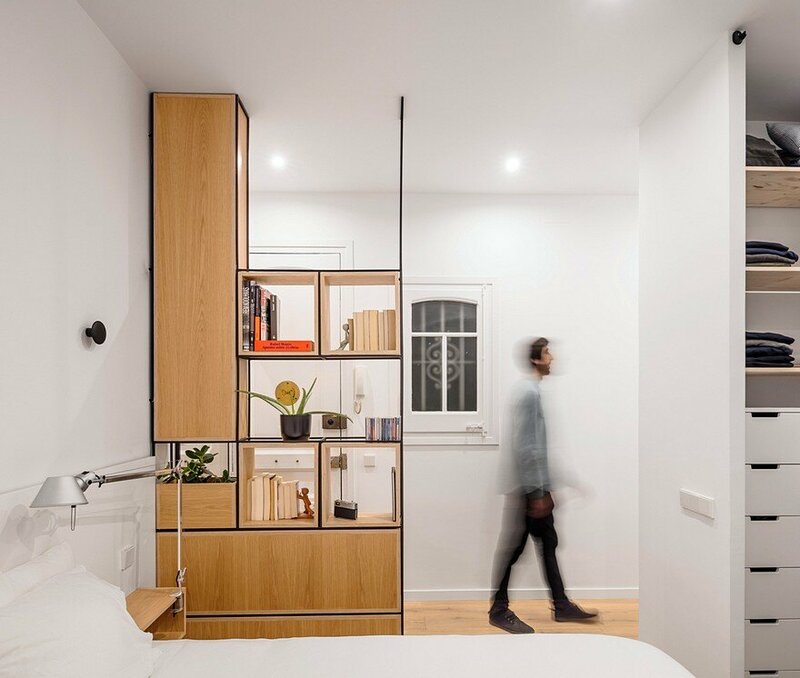 The diagonal view across the space makes the home seem bigger. 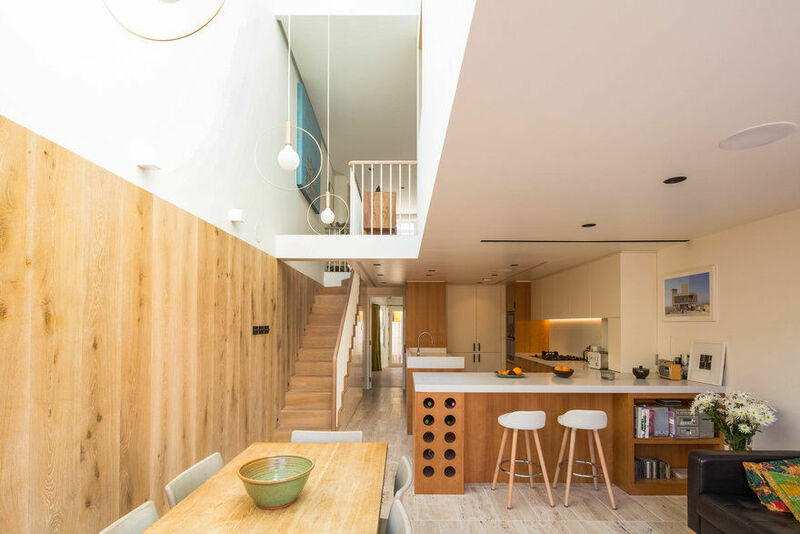 The emphasis is on using durable natural materials – different species of wood and stone. The detailing on the staircase with the Sapele swept handrails with a Georgian profile continues throughout the house. 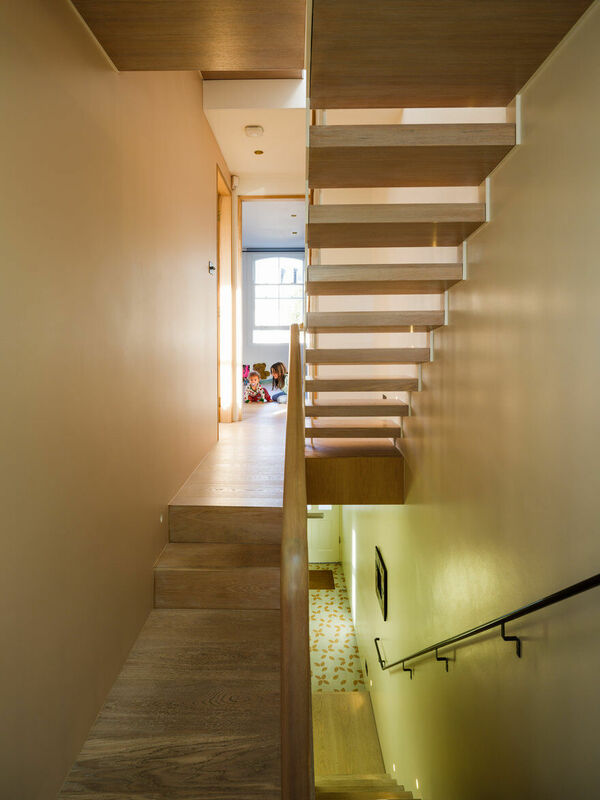 The loft staircase is made of laser cut steel with floating risers allowing light through. 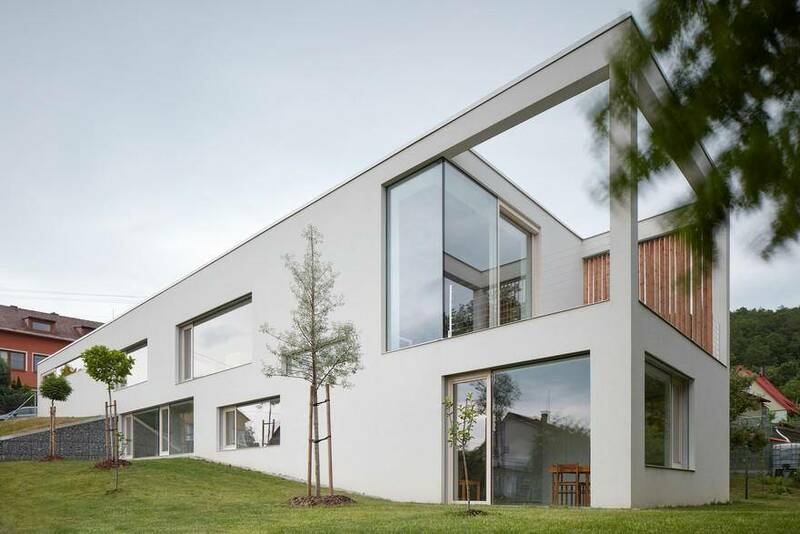 The home is highly insulated with robust airtight detailing. 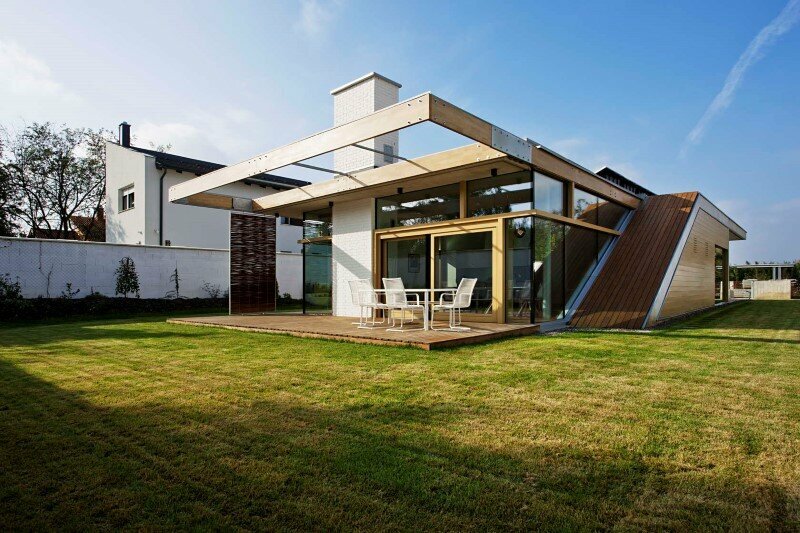 There are four opening vents allowing passive cooling during the summer months. 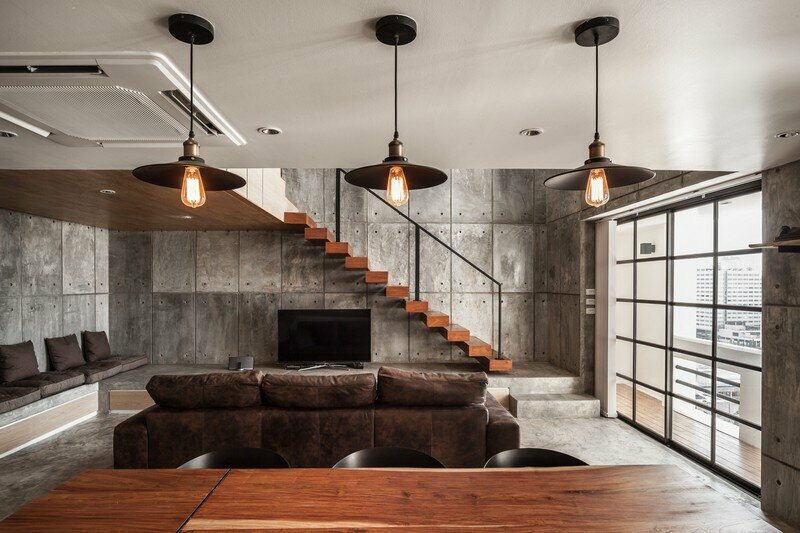 The key materials used were stone and wood – giving an eclectic feel to the home as well as a sense of warmth. The façade of the extension is Cumaru timber. The garden fence is made of Western Red Cedar. Both timbers are extremely durable and have excellent weathering properties. 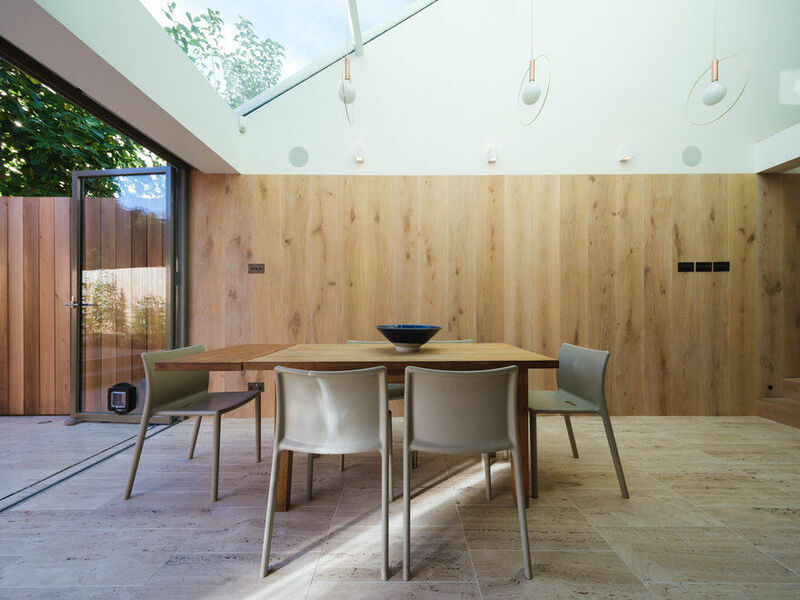 We established a datum line of oak which runs inside to outside – tying in the interior space to the garden. Above this oak datum are white surfaces to allow light to reflect inside. This wood datum / white above theme is carried through in the kitchen design which is made of Yew with a white quartz worktop. ​We chose to make all the accent tactile elements out of metal. Bronze for the door handles and switches, copper for lights. Taps are all matt black brassware. 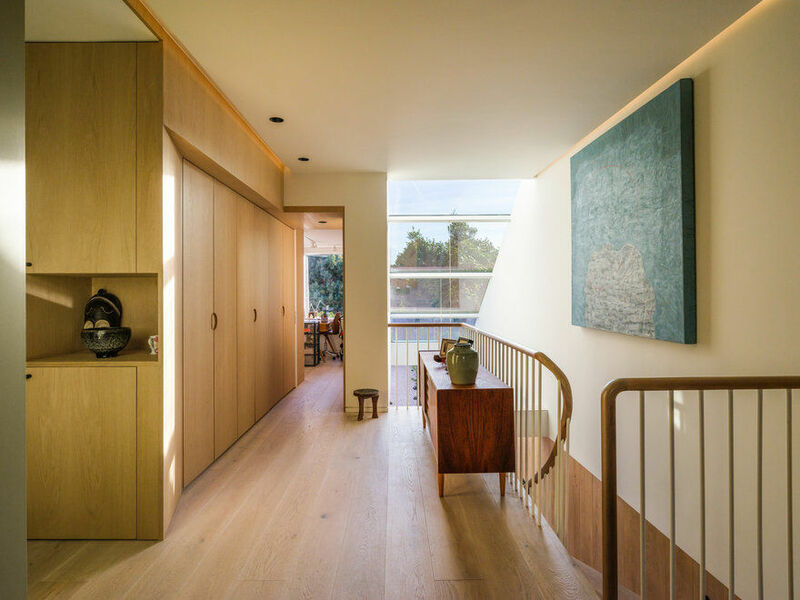 The dining room lights were handmade with copper and brass pendants and in the bathrooms the LED lighting reflects off brass panels giving the home a warm glowing feel. The family bathroom has an opening skylight over the bathtub. 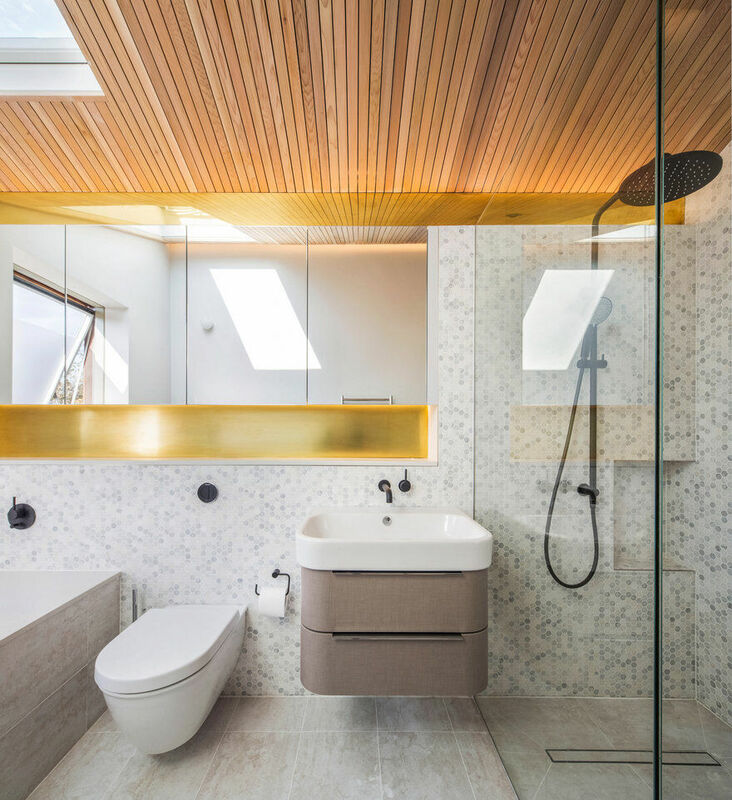 The cedar slatted ceiling is reflected in mirror finish brass panels. 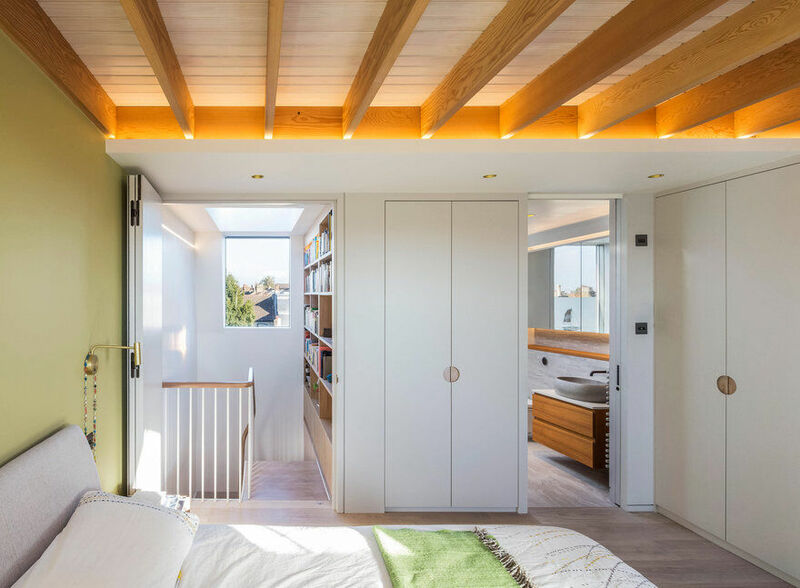 The master bedroom has an exposed Douglas fir ceiling and is connected to an oak framed library attached to a laser cut steel staircase and an ensuite bathroom. 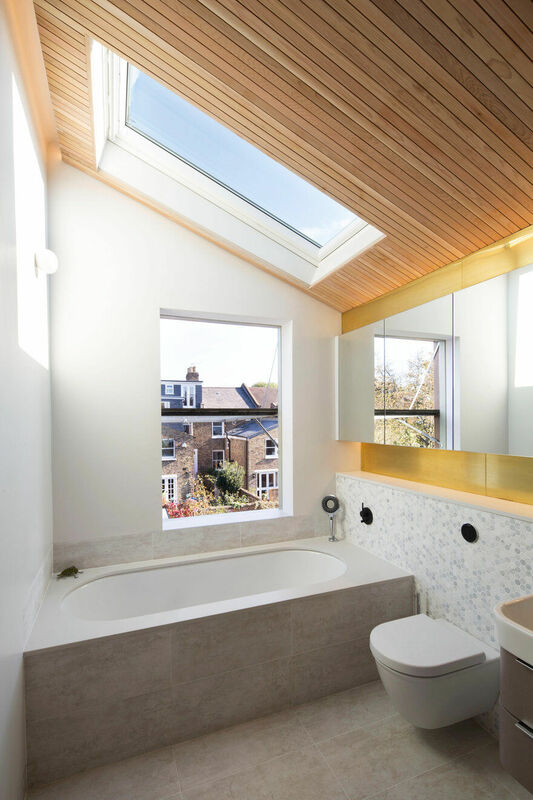 The glass skylight in the bathroom opens completely to allow one to shower outdoors!